In the world of home improvement activity, do-it-yourselfers (DIY) have become a very important market segment. Younger homeowners, with more energy to undertake these projects and generally fewer resources to hire a professional remodeler, generally have been active participants. In 2011, while DIY spending accounted for almost 18% of overall home improvement spending, owners under age 35 devoted 29% of their spending to DIY projects. For 35 to 44 year olds the share was 22%. In recent years, however, these younger owners have become less active in this realm. Before the housing bust, about a quarter of all home improvement spending by homeowners typically was on projects installed on a DIY basis. And even this statistic is an underestimate, because as reported in the American Housing Survey (AHS), a DIY project includes only the cost of the products installed, while a professionally installed project also includes labor and contractor overhead and profit. As such, the Joint Center estimates that on a project basis typically about 40% of all home improvement activities are primarily DIY projects. Home Depot, Lowe’s, and countless numbers of local hardware stores and home centers owe their success to their DIY customer base. However, recent data from HUD’s AHS indicates that the DIY share of the home improvement spending has been steadily declining. As of 2011, it was eight percentage points below its level in 2003 when it reached its most recent high, and six percentage points below the 1995 level, which was a fairly typical year for home improvement spending. This trend is particularly perplexing since the DIY share is thought to be countercyclical. Households are more likely to do an improvement project themselves to save money when economic times are uncertain, according to industry logic. There are, however, other factors that influence the likelihood of undertaking a DIY home improvement. One is the mix of projects undertaken. Households seem quite comfortable undertaking minor kitchen and bath projects and other interior projects like flooring and paneling. They are less inclined to replace their roofing or siding or upgrade major electrical, plumbing, or HVAC systems. So if the mix of projects were to change during an economic cycle, that might well influence the DIY share. Indeed, the mix of home improvement projects has changed in recent years in favor of exterior replacements and systems as more discretionary projects have been deferred. 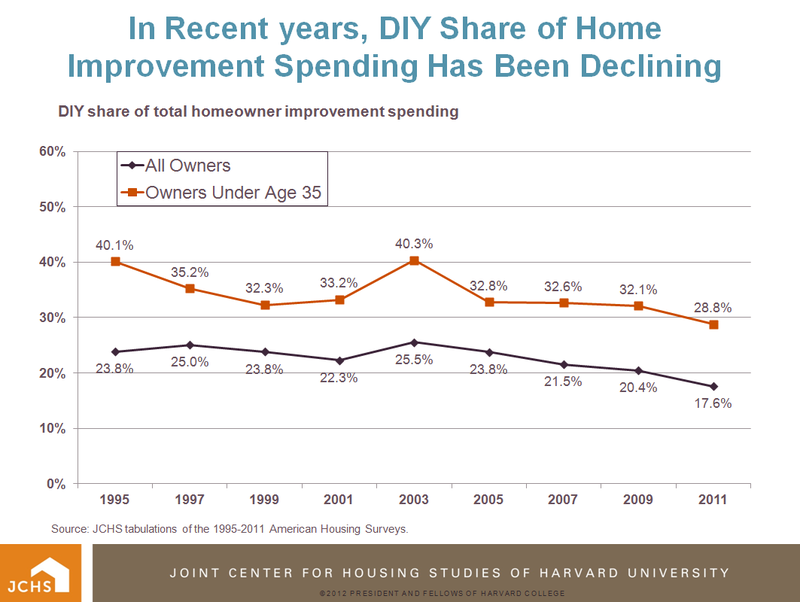 However, the DIY share of spending within all major home improvement categories has been declining. 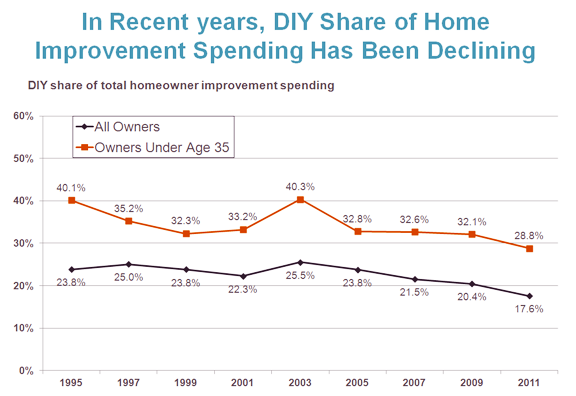 In 1995, 30% of spending for kitchen projects was done by DIYers; by 2011 that share had dropped to 22%. Ditto for bath projects (30% to 26%); exterior replacements (17% to 12%); systems and equipment upgrades (16% to 15%). With the DIY share declining for all major categories, the mix of projects is much less important in explaining the decline in the overall share. A more likely explanation is that traditionally active younger owners are less engaged in these activities. Younger owners seem to have less inclination or ability to undertake these projects, at least in part because they have been hardest hit by the housing downturn. Fewer of them have been buying homes, and the ones that did were more likely to have purchased nearer the peak of the market. As house prices fell, many lost their homes to foreclosure or short sales. Of those that have remained homeowners, most have lost a significant share of the equity in their home, with many currently underwater with their mortgage. All of this has discouraged young owners from undertaking all kinds of home improvement projects, including the DIY variety. Between 1995 and 2011, the DIY share for owners under age 35 fell twice as much as for the overall population. Indeed, in 1995 owners under age 35 accounted for 22% of all DIY spending. By 2011, this share declined to 16%. Older owners have continued to undertake some DIY projects, but not enough to offset the decline of younger owners. With younger owners doing fewer projects, it’s likely to take a broader recovery in the housing market to get these younger owners back to improving their homes, and to get DIY activity back near its historical levels. Doing it yourself at any age can be a major challenge some people just aren't up to completing. The younger generation definitely has more energy but might not have the expertise. Older people have the knowledge but often have little time or energy for DIY projects. Of course professionals are always willing to fix it up - for a price. I agree with Matt, you can Do It Yourself anytime your life time. Its all a matter of when to decide to take up a certain skill or handyman trade. They come in handy, some could say! That's kind of interesting. You would think that during a rough economy more people would be trying to tackle DIY home improvement projects more often to save money. Home remodeling is the process of making additional improvements to your existing house. It is an indication of our emotional attachment to where we live. The process of personalizing ones home can bring both sentimental and monetary value. However, a satisfied outcome is never guaranteed.